The sunny season is almost there, it's the perfect time to learn hula hooping! It's still time to register! Welcome to the exciting world of hula hoop! Hoop Fitness is a great and super fun way to stay fit. It requires no hooping experience as the instructor teaches several variations of difficulty for each movement, depending of participants’ skill level. You can join the group anytime, no matter your experience. All packages are valid for Tuesday and Thursday classes, but you still need to register for the course. By clicking the link below, you will be redirected to the Verdun Circus School website for registration. Perfect for getting started and building a strong hooping foundation. A mixture of techniques, fluidity exercice and specialized workshop. You will learn basic movements such as spin around the waist, hips, knees, neck, and hands, as well as several impressive transitions such as the vortex and the shimmy. These will be integrated to transform the technique into fluid and graceful movements. You will learn to use the whole body in your practice. You’ll do much more than just spin a hula hoop around your waist after this first course! The course format allows you to buy only the number of classes you need, and use them any time during the session. This course is given in collaboration with the Verdun Circus School. Hula hoops are provided free of charge. You will learn basic movements such as spin around the waist, hips, knees, neck, and hands, as well as several impressive transitions such as vortex and shimmy. These will be integrated to transform the technique into fluid and graceful movements. A more flexible way to learn hula hooping, perfect if you already know how to spin the hula hoop at the waist and hands. You will learn and improve basic hooping movements and transitions and develop your flow and your control. All of that at your own pace. You can join the group anytime. On top of sweating and having fun, you will come back from this class with an analysis of your functional movements, warm-up ideas, and challenges to add to your hooping practice, as well as movement ideas for functional training. 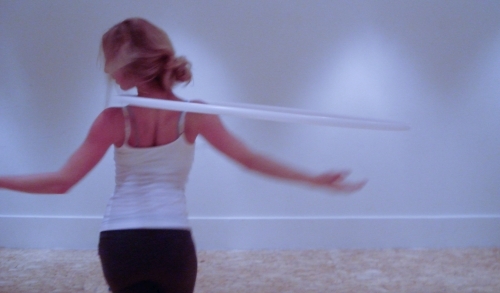 A beautiful marriage between the magic of hula hoop and the yoga traditions. The concept of hoop yoga is based on the idea that the hula hooping is a form of active meditation. Yoga postures (asanas) bring flexibility to the body and connection with our highest self. The combination of hula-hoop and yoga, while respecting the yogic tradition, brings joy of living and inner peace. A new, more flexible type of course that allows you to learn at your own pace. You will learn and improve intermediate level movements and transitions, and improve your fluidity and your control. You can join the group anytime. Much of this course is dedicated to integrating movements and developing fluidity. You will improve your technique and learn a whole series of vertical moves as well as refine beginner level movements. Learned techniques will be integrated into fluid and graceful movements. Learn to use the whole body in your practice. Learn how to use your technique to create smooth and graceful dance moves and find you flow using the whole body. In this course, you will learn varied and original sequences, and you will create your own! A unique and original class that will expand your hooping capabilities. Learn all kinds of techniques to toss your hula hoop gracefully and catch it effortlessly. We learn timing, altitude, and control. You will be surprised by all the variations you can do while tossing a hula hoop! Under the supervision of a certified pyrotechnician and fire hooping expert, learn the safety and the bases of this magnificent art. Light one branch at a time to gently familiarize yourself with the element. You will always be in teams of two to have maximum security. A lot of pleasure in sight! A unique class in Montreal, offered only once a year. Do not miss it! Learn the basics of simultaneous manipulation of two hula hoops. Moving his hoop on two different parts of the body and making movements similar to the “Poi” are shown. It’s an excellent class to develop coordination! Further improve your hooping technique with your feet and hands while lying on the ground. You will learn several variations and original transitions. A fire jam offers the opportunity to practice fire hooping under the supervision of a qualified instructor. The event is canceled in case of rain. There are usually 2 hoops available, otherwise bring your wicks! Registration not required. An outdoor free for all get together without instructor. We set the date, time and location and you come to practice, socialise and have fun. You must bring your own hoops. Registration not required. The course you are looking for is not there? Let us know and be notified when the course is offered. All year long, we offer a dozen different courses, ranging from introductory courses to advanced courses, as well as private and semi-private classes. Exclusive to Hoop Montréal, Hoop Fitness is a great and fun way to stay fit. It’s accessible to all level, including beginners. Get a quality hula-hoop for adult at our unique Hoop Boutique. We always have a good selection in stock. The first bilingual English&French hula hoop learning DVD for beginner. Perfect for learning at home at your own pace. Contact us to organize an event at your work, a private workshop, a party animation or any other idea of your own. Guaranteed fun! We offer instructor training every two years. Learn how to build and conduct effective classes and more!